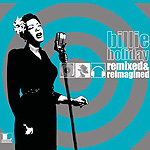 CD reviews: "Billie Holiday: Remixed and Reimagined" and "Nina Simone: Remixed and Reimagined"
These reviews first appeared in Turbula in October 2007. Two recent releases from the Legacy vaults that take classic jazz/soul master tapes and hand them over to mixologists for an updating show that the whole remix thing can be very much a matter of hit or miss. The Billie Holiday set falls a bit flatter than the Nina Simone outing  due in no small part to the fact that Simone was a far more contemporary singer than Holiday. Whereas Holiday began her career in the 1930s during the Big Band era, and came to her greatest fame as an oh-so-cool jazz singer in the '50s, Simone began her career as Holiday was dying and even scored a soul hit in the '70s, her own "Young, Gifted & Black." And so Simone's source material simply lends itself more readily to the hip hop beats than does Holiday's. Simone's cover of "The Look of Love" is particularly well-done, giving it a nice dance groove over a house beat. Holiday's very singing style, on the other hand, is ill-suited for an eletronica/techno approach. Unfortunately, that reality didn't stop the remixers from having their go at her recordings. The vast majority of what's here has a disjointed, out of sorts feel to it. The reworking of "Summertime" strips away the haunting emotional realism of her original and turns it into a cold, robotic bit of chill. If Sony is going to forge ahead with this series, here's hoping they find producers willing to say "no" when efforts clearly aren't working.